A talented field of men’s 200 freestylers stepped up to challenge Gabriele Detti at the 2017 Italian Championships, but the distance ace landed on top of the podium. Gabriele Detti ﻿went 3:43.36 for a new national record and a new world-leading time in the 400 free to start Italy’s national championship meet. Italy’s rising breaststroker Nicolo Martinenghi kicked off the 2017 Italian Championships in style, busting his own junior world record in the 50 breaststroke with a 26.97. On day 3 of the Italian Championships, Matteo Restivo popped a 1:56.55 in the 200m backstroke to break the national record. The old record was a 1:56.91 done in 2009 by Damiano Lestingi at the Rome World Championships. Restivo, who was barely under 2 minutes in the morning, is now the 2nd Italian to ever break 1:57 in this event. Restivo ranks 3rd in the world so far this season. 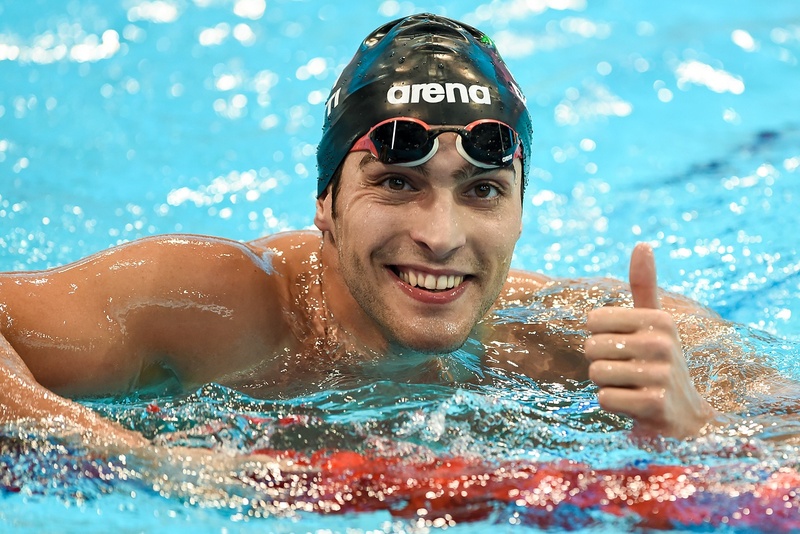 Gabriele Detti, who broke the 400m free Italian record on Tuesday, went 7:41.64 for a lifetime best in the 800m free. He came within a second of Gregorio Paltrinieri‘s 7:40.81 national record, and is now ranked 1st in the world. Detti’s old personal best was a 7:42.74 from 2014. Paltrinieri was 2nd in the race, going 7:48.89, which is still the world’s 2nd-fastest time this season. He previously held the world’s top time before this race. Winning the 50 fly, Piero Codia popped a 23.67 in a tight race. 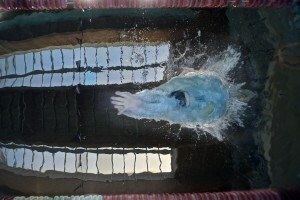 Andrea Vergani was close behind at 23.70, as Matteo Rivolta (23.85) and Alberto Razzetti (23.90) also broke 24 seconds. Codia was a bit faster in prelims, a 23.57 that ranks him 4th in the world this year. Iliara Bianchi was the only woman to crack the world top 5 tonight. Winning the 100 fly, she posted a 57.90 to improve upon her 58.03 from March, now sitting 5th in the world this season. Silvia Di Pietro (58.07) and Elena Di Liddo (58.28) finished up right behind her. In the closing relays, GS Fiamme Oro Roma took the men’s 4×100 free relay, while Circolo Canottieri Aniene won the women’s 4×200 free relay. Marco Orsi led off the Fiamme Oro Roma relay with a 49.05, and they got a 48.11 anchor leg from Alessandro Miressi, a teenager born in 1998. Among all of the relays, other sub-49 splits came from Alessandro Bori (48.95), Giovanni Izzo (48.91) and Filippo Magnini (48.37). Federica Pellegrini anchored Circolo’s 800 relay with a 1:57.60. Margherita Panziera took the women’s 200 back in 2:10.88, which does crack the world top 25. In the women’s 400 IM, Stefania Pirozzi went 4:38.40 to break the Italian Champs meet record in a time that places her 8th in the world this year. Italian doctors are back in business. Hopefully one of the Italians can knock out Sun Yangs 1500 wr and his textile 800 record at worlds this summer. That 7:32 800 suited and probably doped world record is so crazy. they seem to have the powerhouses to do it . Its time those 2 WR to go down .